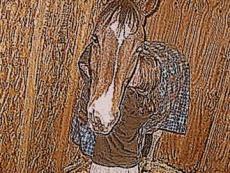 A poem I wrote about one of the horses I am lucky enough to have in my life. In you I've found acceptance. In you I've found a friend. I fit perfectly in the groove of your back. My feet perfectly graze the underside of your belly. My arms just barely clasp around your neck. to what is on the outside. But I know you are the only one who really sees. you treat me like your friend. and hug me with your head. You don't care that I'm not popular. You don't care that I am a clutz. You call to me when you hear my familar footsteps. Your nicker warms my heart. © Copyright 2019 horsecrazychica. All rights reserved.